Homemade jams, chutneys and cakes will adorn the stalls through the town, as well as delicious fudge, succulent smoothies and delightful crepes. Visitors will be hard pushed to avoid the temptation of tasting! Caerphilly Food Festival is pulling out all the stops to make it an event to remember, and one that will draw visitors from near and far! This year's event will descend on the town centre on Saturday 11th May. 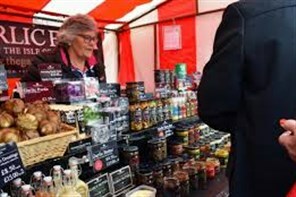 The high street will be adorned with stalls offering a food market through the town and hosting a feast of entertainment for all ages. A variety of food stalls will line the street filling he town with delicious smells and sizzling sounds of a bustling food fayre! Foodies will be in their element as cookery demonstration programmes accompany the festival, offering inside information on how produce is made and how to improve your own culinary skills. Lets tickle those taste buds and set the streets alive! There will be an abundance of attractions for visitors of all ages to see with fun activities and entertainment enhancing the street festival, bringing fantastic colour and excitement to Caerphilly. The Caerleon Roman Fortress and Baths, also known as the Roman Baths Museum, is located in Caerleon in the city of Newport, south-east Wales.